Voters wait in line to place their paper ballots into a voting machine during early voting at the Hamilton County Election Commission on Amnicola Highway on Saturday, Oct. 22, 2016, in Chattanooga, Tenn.
NASHVILLE — Several black officials in Hamilton County say they're hearing scattered concerns about early voting, from too few local voting sites to minority voters being quizzed by poll staffers about their photo IDs. The officials said the two-week early voting period, which ended Thursday with 73,793 ballots cast locally, went off well in many respects. But they say they fielded a number of complaints, especially about long lines and wait times at the Brainerd Recreation Center voting site. Early voting also took place at Brainerd, Northgate, Collegedale and the Hamilton County Election Commission on Amnicola Highway. Chattanooga Councilman Moses Freeman, who is black, said many black voters live in Brainerd, but there are also many minority and poor voters in South Chattanooga neighborhoods including Alton Park, St. Elmo and East Lake, where there was no early voting site. "I've always thought there should have been more," Freeman said. "I think in a way there's some degree of voter depression when you don't have one in a one major community like South Chattanooga" where there's a "significant amount of minorities" and "no reliable transportation." Freeman said public buses to Brainerd or the election commission headquarters can be difficult to navigate, especially for the elderly. Hamilton County Election Administrator Kerry Steelman could not be reached by email Saturday. But county election commissioner Chris Clem, a former Republican state representative and one-time attorney for the election commission, said the number and general location of early voting sites were basically "the exact same sites that the Democrats" set up 20 years ago for early balloting when they were in charge. "I'd be very offended that they were trying to suggest this was somehow voter suppression," Clem said. Democrats' 3-2 majority on the election commission changed when Republicans took over the majority in the Tennessee General Assembly in 2008. Clem said people in cities like Soddy-Daisy and in the rural Harrison community "have not complained," although they have to drive 30 minutes or more. If "anybody's getting new sites," it should be them, he said. Kelvin Scott, the only African American on the county election commission, said voter feedback led him to believe two more early voting sites were needed because of huge turnout in the presidential contest between Republican Donald Trump and Democrat Hillary Clinton. Scott said some black voters told him they felt "harassed" by poll workers' extensive questioning about whether their current address matched their photo ID. The Republican-controlled General Assembly passed the controversial voter ID law in 2011 to stem in-person voter fraud, although lawmakers could cite only two cases. Scott said he didn't witness any harassment, but he had his own early voting story. He showed up to vote at election commission headquarters wearing shorts and a T-shirt and none of the poll workers recognized him. He said "they kept grilling" him and asked "two to three times" whether his address in their files matched his photo ID. Scott said he told them the addresses matched before he identified himself as an election commissioner. Then, he said, "they stopped, tried to sweeten it up" and let him through. "We've got to do a better job," he said. Rep. JoAnne Favors, D-Chattanooga, the lone Democrat and black lawmaker in Hamilton County's six-member legislative delegation, said Thursday she'd also heard about "problems at the polls" with lines and other issues. "This is what I was told by several African-American voters when they got to the place to get their ballot they would be questioned extensively about their residence, their address, and [poll workers] would not have asked the white people in line anything, they went ahead and gave them their ballots." The black voters she spoke with were "very upset about that," Favors said, though she said she did not witness any voter harassment. She said there were no chairs at the Brainerd polling site for elderly or disabled voters. And both Favors and Scott said they see a need for more black poll workers. Clem questioned why objections weren't raised during early voting, rather than afterward. "We are bending over backwards [to be fair] and it is an argument that I reject completely that it is too difficult to vote in Hamilton," he said. Commissioners could consider more early voting sites in future presidential elections, he said, but renting space and hiring poll workers at $10 an hour for a two-week job isn't easy, he noted. Hamilton County Democratic Party Chairman Terry Lee said he's been working elections since 1972 and he has "never seen a crowd like that" at local polls, with lengthy lines wrapping around the Brainerd site and then some. While he heard reports of voters "feeling a little picked on and intimated nobody was able to give me specific names," Lee said. Hamilton County Republican Party Chairman Tony Sanders said he had not heard of any problems but added, "I'm not going to dismiss anybody's issues when it comes to voter being challenged unfairly. I don't know whether it's fair or not." 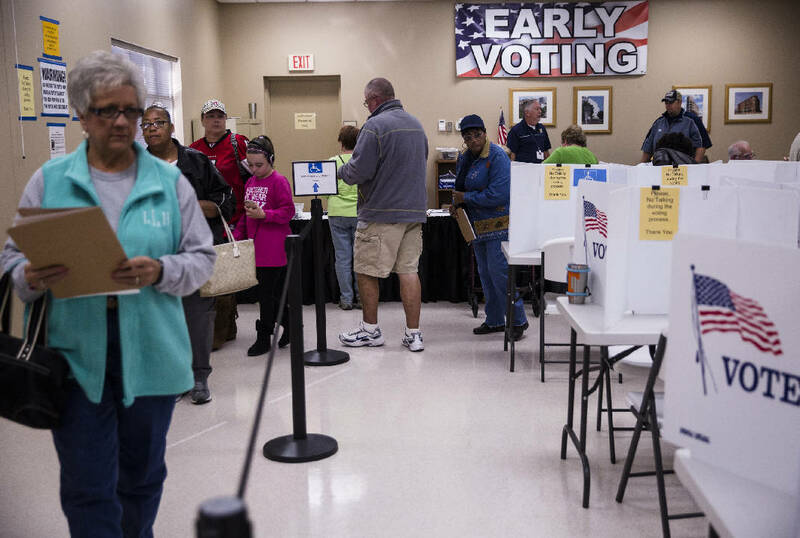 Hedy Weinberg, executive director of the American Civil Liberties Union-Tennessee, said if poll officials are challenging voters "over and over about what their address is and whether they still living there, it's a form of intimidation." "It's not acceptable," Weinberg said. "I would hope that those working the polls have been trained in the way not only to be respectful but to be engaged in support of individuals right to access the ballot box." Voting suppression "should be a concern of all political parties," she said, adding that "we know voter fraud is not a problem but voter suppression is because of the obstacles some place when entering the voting booth."